The early 1980s was a fertile time for fantasy films with the likes of Excalibur (1981), Dragonslayer (1981) and Conan the Barbarian (1982) among others. Time Bandits (1981) came out of Terry Gilliam being unable to get his passion project Brazil (1985) off the ground. He shifted gears and made a children’s fantasy film with fellow Monty Python alumni Michael Palin. The result is a wildly entertaining and inventive romp through time and space. Kevin (Warnock) is a young boy who lives in an anonymous suburb somewhere in England. His parents don’t pay much attention to him except to scold him when he makes too much noise. He spends most of his time reading books about history and ancient mythology. One night, a group of time-traveling dwarves come out of his closet. They’ve stolen a map that allows them to travel through time, which they use to try and plunder valuable treasure, but usually get in all kinds of trouble. They also try to stay one step ahead of the Supreme Being, an imposing entity who owns the map. Much to his amazement, Kevin finds himself experiencing historical events and meeting famous people he’s only read about in books, including an audience with Napoleon (Holm), appearing on the deck of the Titanic as it is sinking, and helping Agamemnon (Connery) fight the Minotaur. The Evil Genius (Warner) wants the map, but is unable to leave his Fortress of Ultimate Darkness, and it will allow him to be free as well as challenge the Supreme Being. Part of the fun of Time Bandits is how it playfully makes fun of famous historical figures. A temperamental Napoleon would rather watch a Punch and Judy puppet show than focus on his rapidly crumbling empire. Robin Hood (Cleese) is blissfully ignorant that his Merry Men don’t like the poor he’s supposed to be helping. However, Agamemnon is treated with reverence and played with casual cool by none other than Sean Connery. Another enjoyable aspect of Time Bandits is the interplay between the group of dwarves, each with their own distinctive personality, and how they bicker among each other. They play well off of Kevin who learns the ropes of time travel from these troublemakers. These bandits are basically disgruntled employees, unhappy with not getting any credit for helping the Supreme Being create Earth and everything on it. So, they stole the map and set out on their own, taking what they felt was owed to them. The performances are uniformly excellent, from first-timer Craig Warnock to the dwarves to the big name stars that contribute bit parts in various segments and are clearly having fun with their juicy parts. They say that the devil’s in the details and Gilliam does an excellent job of immersing us in every time period that Kevin and the dwarves find themselves in, from the muddy forests of England to the sun-drenched deserts of Greece. Time Bandits was made pre-CGI and so a lot of care and attention to detail was paid to each historical time period through the use of practical locations and hand-crafted props. During the ‘80s, Gilliam was one of the premiere fantasy filmmakers with the likes of Brazil and The Adventures of Baron Munchausen (1988). 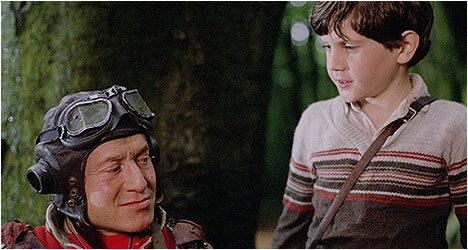 Time Bandits blends child-like wonder with satire and unlike a lot of films made for children it doesn’t sugarcoat things and gets quite dark in tone towards the end. Gilliam has a deep love for legends, myths and tall tales, creating the cinematic equivalent of a fantasy novel and it is hard not to see his influence on the novels of people like Terry Pratchett and J.K. Rowling. Gilliam supervised this Blu-Ray transfer and it looks great with a lot of detail visible and the filmic quality preserved. This is a significant improvement from Criterion’s previous DVD incarnation. Carried over from the DVD version is an audio commentary by director Terry Gilliam, co-screenwriter Michael Palin and actors John Cleese, David Warner and Craig Warnock. Rather fittingly, Gilliam starts off talking about the film’s origins. He excels at recounting filming anecdote and discussing some of the themes. He also recounts a story about how he accidentally injured Shelley Duvall during filming. Warnock recalls his experiences as a child making his first film. Cleese chimes in on his memorable cameo as Robin Hood and his take on the character. Gilliam and Warnock recall working with Connery as the former talks about how helpful the veteran actor was in working with the latter. “Creating the Worlds of Time Bandits” features production designer Milly Burns and costume designer James Acheson as they talk about their work on the film. It was a dream project for them because they got to work on a variety of designs for all the time periods depicted in the film. They also talk in detail about what they wanted to do, accompanied by sketches, stills and clips from Time Bandits. There is a conversation between Gilliam and Peter Von Bagh at the Midnight Sun Film Festival in 1998. The director talks about what influenced him as a filmmaker and what it was like growing up in Minnesota. He speaks highly of the surreal comedy of Ernie Kovacs and the animation of Walt Disney and Tex Avery. Also included is a 1981 interview with actress Shelley Duvall on Tomorrow, an American talk show hosted by Tom Snyder. She talks about working on Time Bandits while also touching upon some of her other work. Duvall comes off as a charming and earnest person. There is a stills gallery of rare, behind-the-scenes photographs of Gilliam and co. at work.